Immediately when you load this game, you’ll have visions of ninjas, all clad in black, skulking through the backstreets of an ancient, Japanese, moonlight city on their way to carry out their mission. The background, the logo, the symbols, the music and the sound effects all come together to create an incredible vibe. This uniquely themed slot is great for anyone with a fascination for ancient Japanese culture or for anyone who’s ever dreamt of being a real-life ninja! Players who enjoy Book of Ra Deluxe, FireStarter, Lord of the Ocean and/or River Queen will enjoy this slot immensely, as will any regular slots player who’s looking for something with a fresh, unique theme! The lower-paying symbols are card value symbols which have been designed in a distinctly Japanese-style font. There is also a scroll, golden bullions, a seductive geisha, a Japanese warrior, a shuriken (a ninja throwing star) and the secretive ninja himself! The aim of the game is to spin at least two or three matching symbols, depending on the symbol, on consecutive reels from left to right, on an active winline in order to get a payout. The size of the payout will depend on the symbol and on the size of your bet, and you can look at the paytable to see how much each symbol will pay out according to your bet. You can change your bet, if you like, by using the plus and minus symbols to increase or decrease the number of lines you’re betting on, as well as the amount you’re betting on each line. Out of these symbols, two of them are very special! The shuriken is the Scatter symbol and this pays out wherever it lands on the reels, regardless of whether or not it lands on consecutive reels or whether they land in a winning line. What’s more, when you spin three or more of these symbols, you’ll trigger 10 free games! The ninja himself is the Wild symbol, which means he can substitute for all other symbols, except the shuriken Scatter symbol. 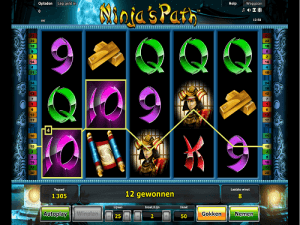 The free game feature in Ninja’s Path can be extremely lucrative, especially because of the generous multipliers! During the free games, every win (except wins with the ninja symbol) are multiplied by 2! Every single time a ninja symbol falls on the reels, you’ll have the opportunity of winning more free games: 1 ninja symbol = 1 extra free game, 2 ninja symbols = 2 extra free games, 3 symbols = 4, 4 symbols = 30 and 5 ninja symbols = 50 extra free games! Moreover, the appearance of the ninja not only gives you more free games but also increases the multiplier – which can go all the way up to x9! This 5-reel, 25-payline slot, brought to you by NovomaticCasino.co.uk, is packed full of familiar features. These include ‘autoplay’ which, when enabled, spins the reels for you without you having to do a thing, and the gamble feature. Whenever you get a win, you can choose to collect of gamble it – if you choose to gamble it, you’ll be faced with a choice: red or black. Guess correctly the colour of the next card in the sequence and you’ll double your bet! NovomaticCasino.co.uk also has many other games on offer which you can check out for yourself. Our live dealer games are the most realistic and are really fun to play – join a real table with a real dealer, all in real time! Choose from: Live Baccarat, Live Blackjack, Live Roulette and more!